As Brandeis’ first president, Abram L. Sachar effectively built the university from the ground up into a first-class, internationally recognized teaching and research institution by exercising his abilities as an educator, visionary and fundraiser. An American historian and longtime professor of history at the University of Illinois, Sachar held a Ph.D. from Cambridge University in England. 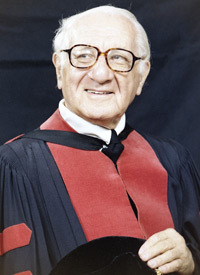 During his long career, he served on numerous committees and boards, was the recipient of many honors and published a number of books, including "A History of the Jews" and "The Course of Our Times." On his retirement as president, he became chancellor of the university, and later, chancellor emeritus. Sachar died in 1993 at the age of 94. A treasure trove of documents and information about Brandeis University presidents may be found in the university archives.